I know cupcakes are a bit passé, but I don’t much care. These cupcakes had to happen. And they need to happen over and over. And now they need to happen in your kitchen. And then in your mouth. I’m going to get straight to the point today. I can’t even handle how good these cupcakes are. R described them as possibly the best thing I have ever made (although didn’t he say that about the jalapeno beer corn bread? 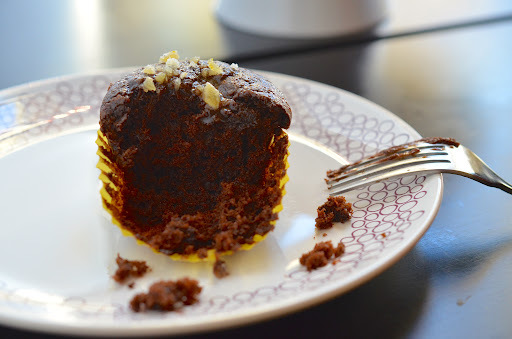 Maybe he is just easy to please… or wants to keep me happy so I keep baking…) and N suggested that they might be the best cupcake he has ever had. I tend to agree with both of them. I don’t have much nutritional insight to offer here… since, well… these are cupcakes. They are obviously vegan, and I used olive oil and applesauce in them… and that is about as nutritionally sound as they get. 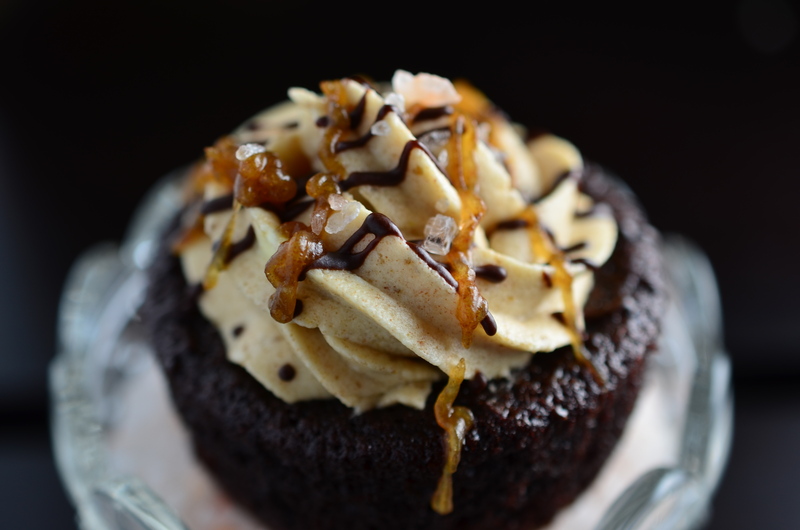 Except that the salted caramel frosting is actually made with anything but. The salted caramel sauce in it used the date caramel you saw in my baked oatmeal. I. Can’t. Get. Enough. I don’t even like frosting (I almost always wipe it off of my cupcakes), and I found myself dipping into the bowl with a spoon. It’s that good. 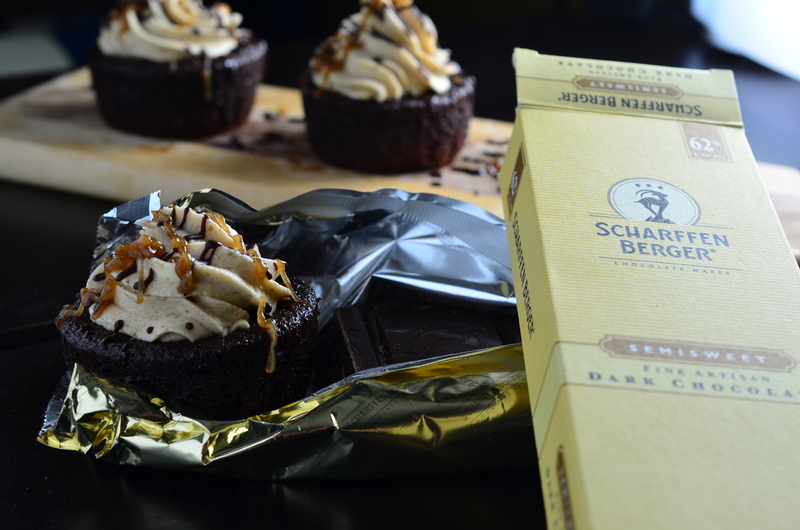 Here’s the skinny/fat/whatever: high quality chocolate riding the silky olive oil express straight to your mouth. You can’t necessarily taste the olive oil, but I know its in there, and it makes me happy. They are super chocolaty and every bit as light. For something as decedent as these, you almost feel lighter after eating them. I bestowed a batch on my roommates this weekend, I bestowed another batch on my lab this morning, and another batch will be presented at book club tonight (for those of you that read this before book club tonight, get pumped). Now it’s your turn to spread the love! Preheat oven to 350F and line cupcake tin with 12 paper liners. In a large bowl, pour the hot coffee over the chocolate and cocoa powder and mix until melted and smooth (if all of the chocolate doesn’t melt, pop it in the microwave for about 30 seconds). In another bowl, combine the flour, sugar, salt, and baking soda and whisk to combine. In a third bowl, combine the olive oil, apple sauce, cider vinegar, and vanilla and whisk to combine. Add half of the flour mixture and half of the liquids to the chocolate and mix for about 1 minute (the color should lighten slightly as the vinegar reacts with the baking soda). Add the remaining flour and liquids and mix for an additional 2 minutes. Fill prepared cupcake liners 3/4 full and bake for 18-20 minutes until an inserted toothpick comes out clean, remove from oven. Leave in the pan to cool for 5 minutes before turning out to cool completely on a wire rack. One the cupcakes have completely cooled, swirl the salted caramel frosting (I used a wilton 35 closed star tip) on as you see fit. It is also acceptable to pipe frosting directly into mouth here. 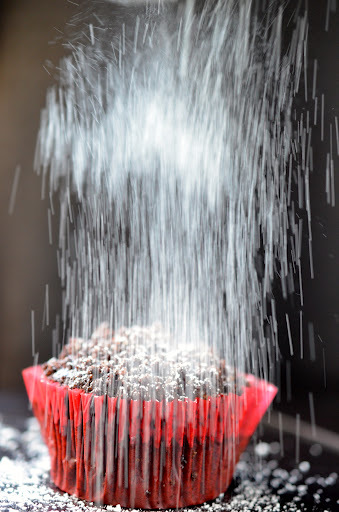 Optional: drizzle on some melted chocolate and sprinkle on some flakey sea salt. Place pitted dates in food processor and blend until they form a big ball. Add the milk, vanilla, and salt and process until smooth and creamy. Bring the margarine and shortening to room temperature. Beat the margarine and shortening together in a stand up or hand mixer on high until light and fluffy, about 1-2 minutes. Reduce speed to low and slowly start adding in the sugar until desired consistency is reached (another 2 minutes). It may take on the look of coarse sand when you first add the sugar, but keep beating and it will turn into fluffy frosting. Add the caramel sauce, more or less depending on more caramely you want it, and beat for an additional 2 minutes. 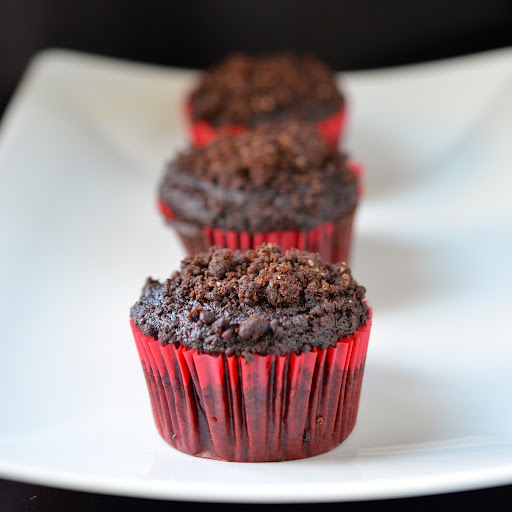 This entry was posted in baked good, Chocolate, Cupcakes, Dessert, Vegan on February 20, 2013 by Veggie with a Cause. Happy Monday! 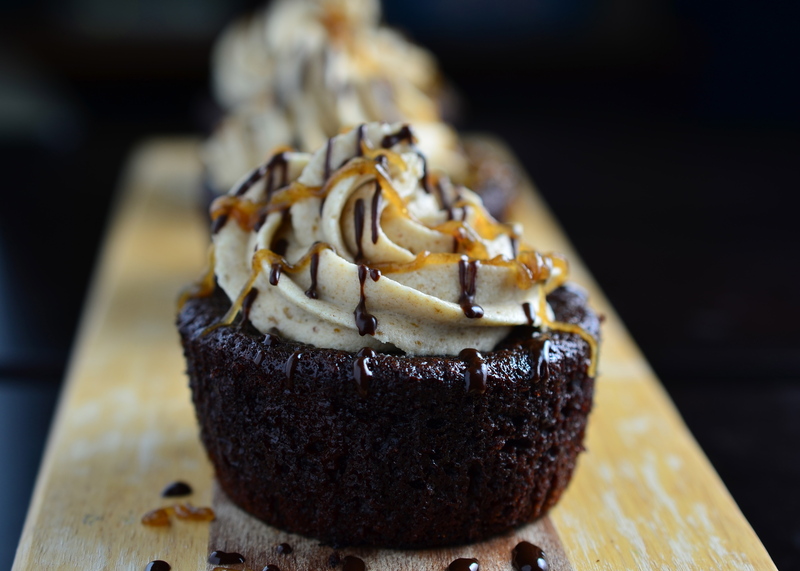 As a tribute to the weekend that we are now mourning (when just mere hours ago you were sipping a craft beer chatting about who-even-cares with your besties, and now you find yourself back in your cubicle)… I bring you cupcakes! Boozey cupcakes! Who doesn’t love boozey cupcakes? The alcohol cooks off, it doesn’t taste that strongly of booze… but just knowing that it is in there makes the whole experience a little better. And hopefully it will transfer you back, even if just for a moment, to that creaky porch or crowded bar. I know I spoke of these noble conquests of bringing you a plethora of cupcakes. And I know that I have not done that. Honestly though? These cupcakes have not stuck around long enough to photograph them. 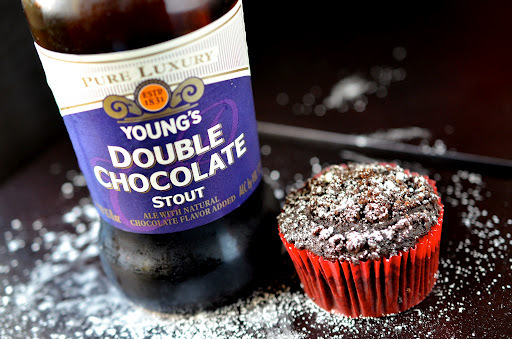 The cupcake of which of speak, that I am here to share with you, are chocolate stout cupcakes. 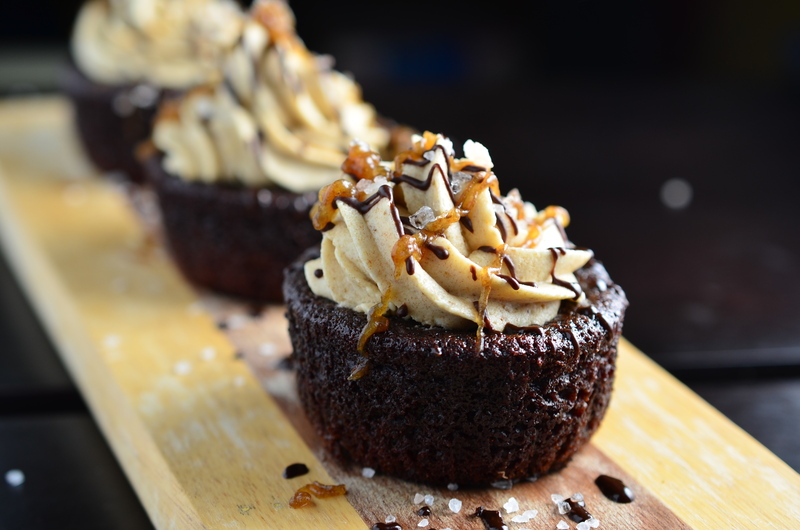 In the spirit of being a manly cupcake, they aren’t overly sweet and are not loaded with some fluffy or frilly frosting. Nope, none of that. The chocolate and stout really take the main stage here… and trust me, you wouldn’t want it any other way. And that main stage is a cloud. A chocolatey cloud floating in a river of beer. Mmmmmm. 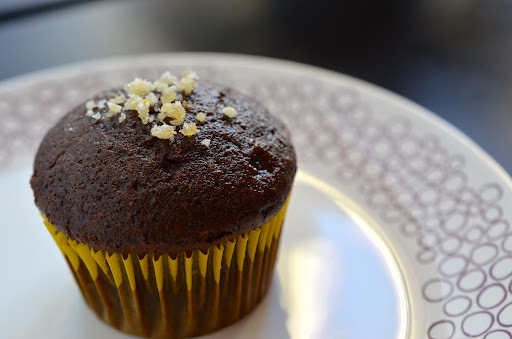 As an aside, you are getting this recipe now because I noticed on Saturday morning that there were still 3 cupcakes left from the batch I had made a couple of days before. I was waiting for my barley to cook and jumped at the opportunity. So there I sat, unshowered, squatting by my coffee table in front of the window with my camera in one hand and powdered sugar sifter in the other. Do you know how difficult it is to get a good shot while trying to shake the powdered sugar in one hand and snap the photo with the other? 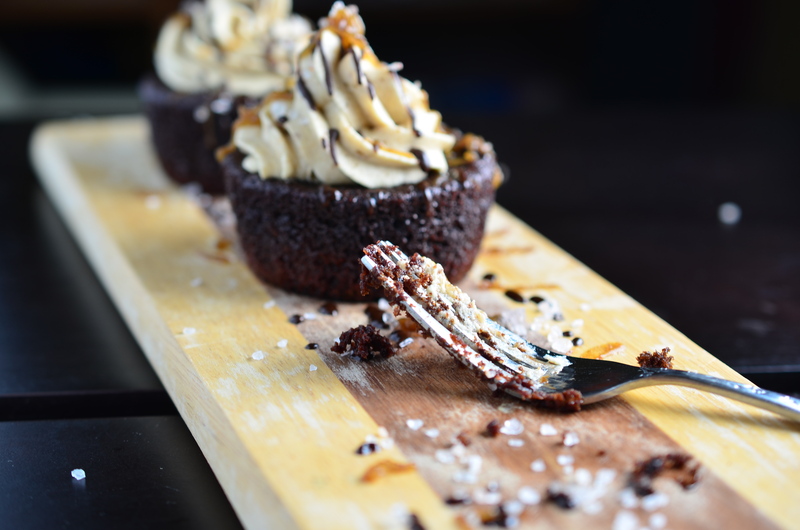 That is how eager I was to share these cupcakes with you! 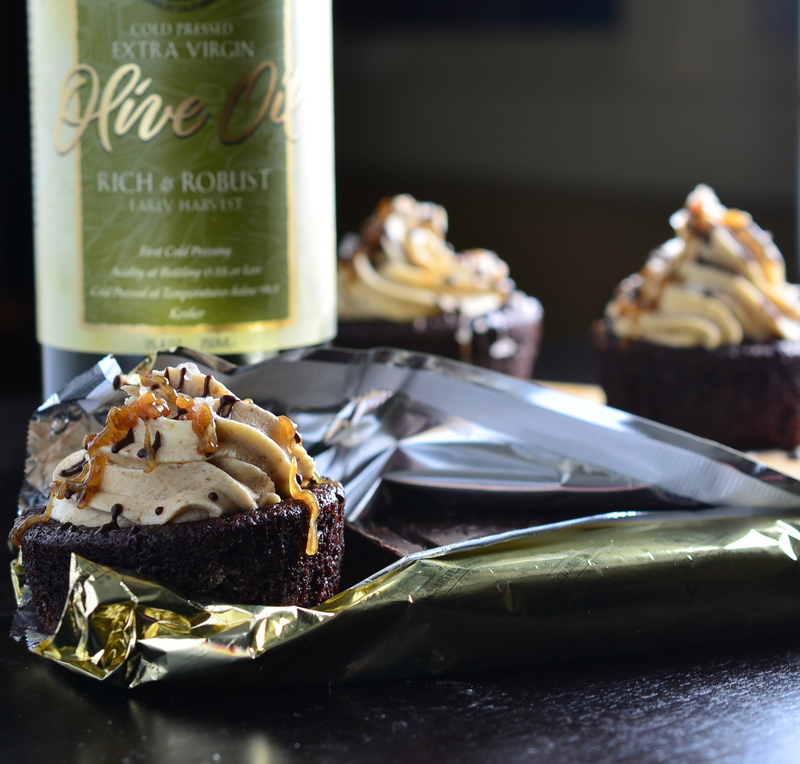 So go forth, my friends, and make these boozy cupcakes. Preheat oven to 350F and line muffin pan with paper liners. Combine the cocoa power, flour, and sugar. Slowly drizzle in the oil while tossing with a fork until crumbs form. Once all the oil has been added, toss and stir the crumbs with your fingers for about 30 seconds. Whisk together the milk and vinegar in a large bowl and set aside. 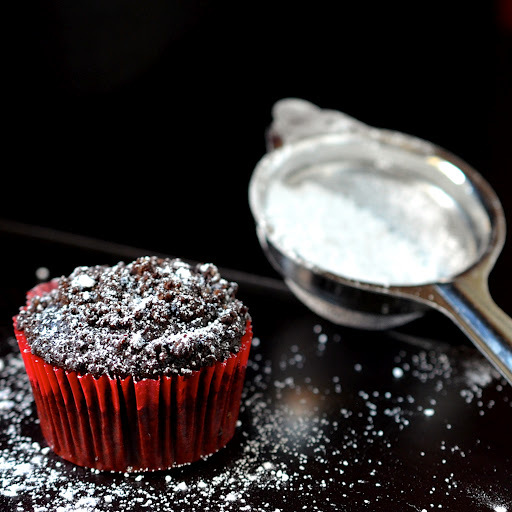 In a separate bowl, combine the flour, cocoa powder, baking soda, baking powder, and salt. Add the stout, sugar, oil, and vanilla to the milk and beat until foamy. Add the dry ingredients to the wet in two batches and beat for about 2 minutes. Pour batter into liners until about 3/4 full. 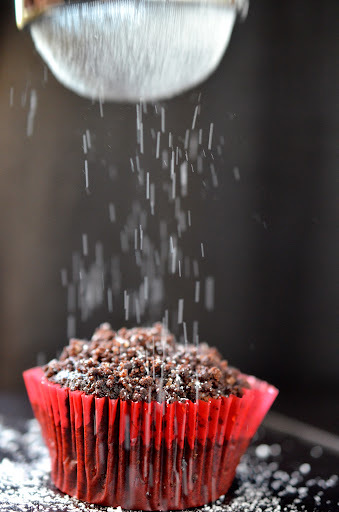 Gently sprinkle with crumb topping so that the crumbs rest on top. Once cooled, you can dust with powdered sugar. 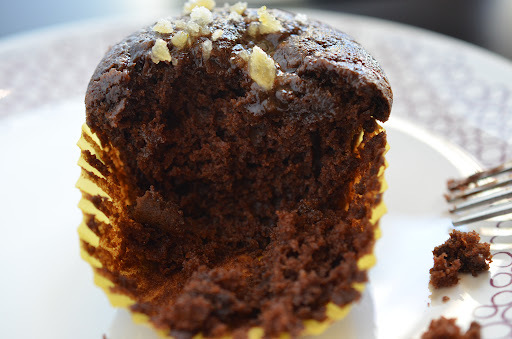 This entry was posted in Chocolate, Cupcakes, Vegan and tagged baked goods, chocolate, cupcakes, vegan on September 18, 2012 by Veggie with a Cause. It is the weekend (or it was while I typed out this post), and that means baking and leisure cooking. I kicked off my Saturday with this awesome Harissa spiced zucchini and tofu “frittata” and then continued on with some Chocolate Orange Ginger Cupcakes. 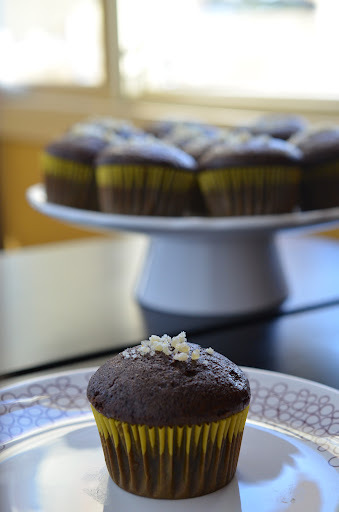 I know that I am going to be a little late/completely miss the cupcake bandwagon, but I made 2 batches of cupcakes this weekend, and have plans to make many more this week because I. Can. Not. Stop. This has it’s pluses and minuses. A plus is that I really enjoy baking, and I am looking forward to getting creative with cupcakes. However, I am going to Hawaii next week… so maybe eating 2+ cupcakes a day isn’t an awesome pre-bathing suit plan? I loved many things about these cupcakes. First of all, they rose so nicely and had this beautiful domed top that was perfect on its own and didn’t need frosting. And I actually really don’t like frosting, so I just put a smear of the recommended glaze and sprinkled on some crystalized ginger for the win. They were chic, classic, and completely delicious. Preheat oven to 375 degrees and line muffin tins with cupcake liners. Add coffee through orange juice and thoroughly mix. Slowly, while mixing, add in vinegar. The batter will foam a bit a turn white, set aside until mixture darkens again. Divide batter between 12 cupcake liners and place in oven for 20 minutes. Remove from oven, cool in pan for 5 minute, and then move to cooling rack. 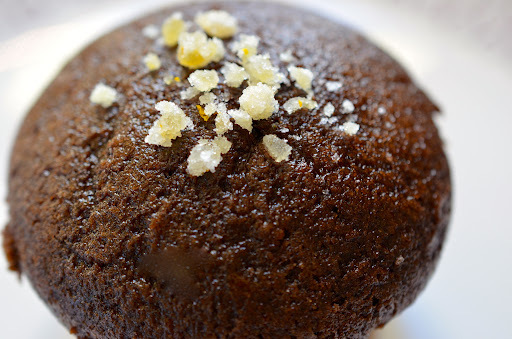 To Decorate: Mix together the powdered sugar and orange juice until fully dissolved, brush tops of cupcakes with the glaze, and sprinkle on crystallized ginger. You will probably want to eat 1 or 2 immediately, you know, to test them out. 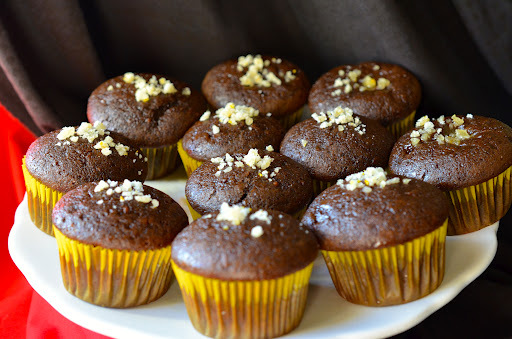 This entry was posted in Chocolate, Cupcakes, Vegan and tagged chocolate, cupcakes, vegan on August 20, 2012 by Veggie with a Cause. I am a twenty-something lady enjoying the bounty that Northern California has to offer while working on my PhD in Molecular and Biochemical Nutrition at Berkeley.